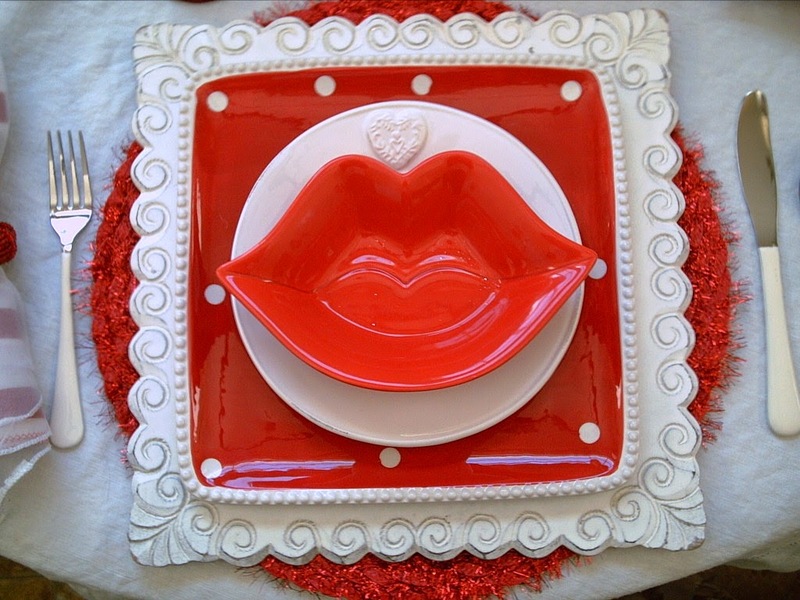 A Twist on the Traditional Heart Theme Valentine's Day Tablescape. I fell in love with these adorable Red Lips Bowls from Tai Pan Trading. They sell out fast! 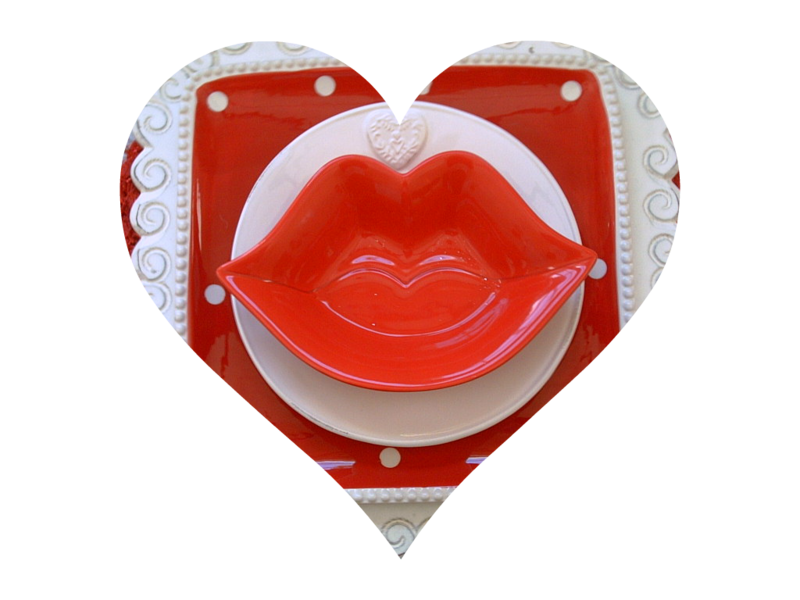 A fun amusing Valentine's Day tablescape! Happy, happy, happy smiling red lips. All that was needed for a centerpiece is my ruffled cake plate With some fun Red Velvet cupcakes. 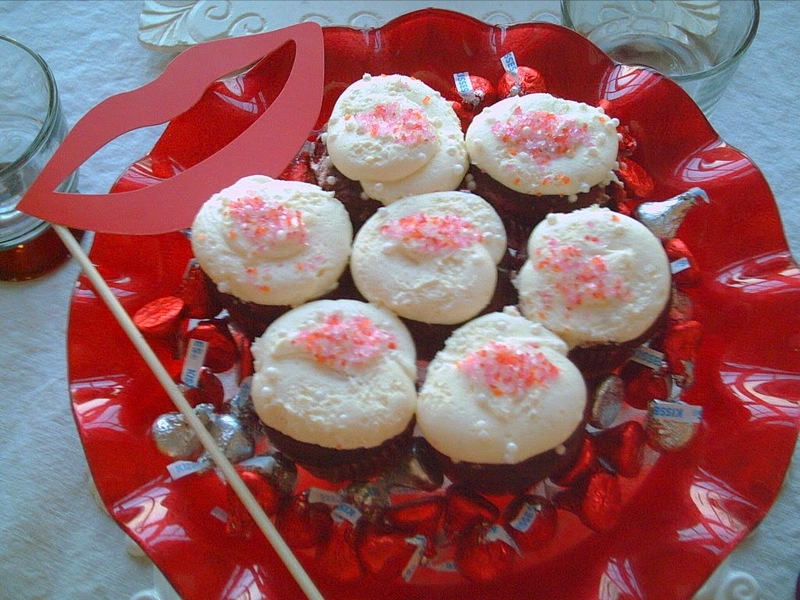 I added some sugared lips on the top of each cupcake. All you need to do is make a stencil and place upon the cupcake top and sprinkle on your sugar. Voila! 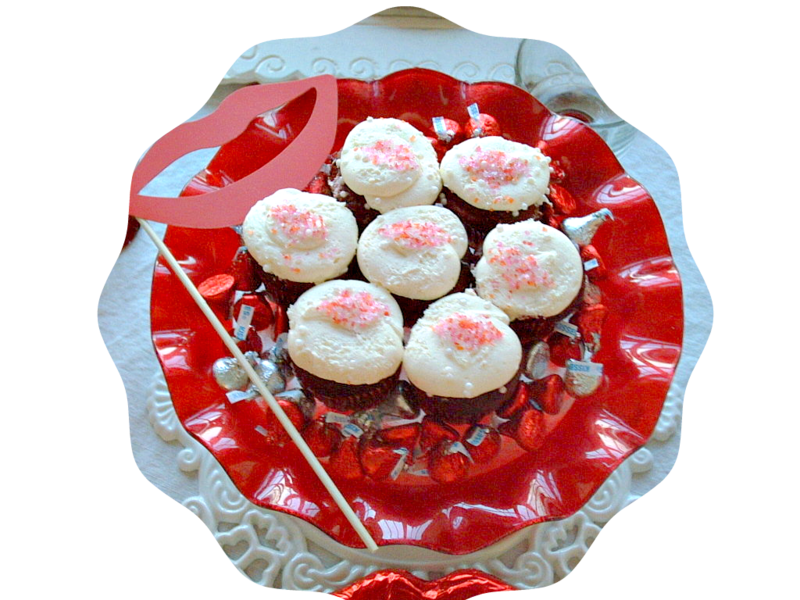 For an extra treat while conversing there are some Hershey kisses sprinkled around the edge. 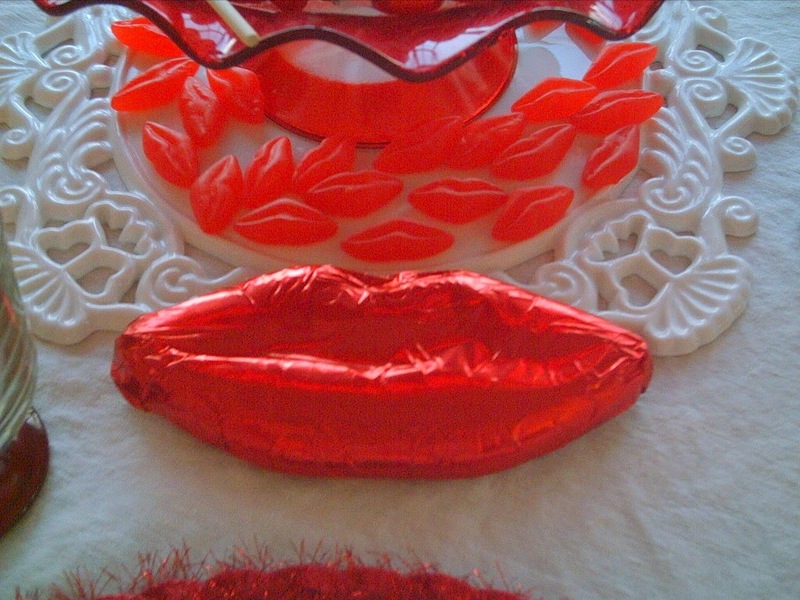 Around the base of the centerpiece I placed some cinnamon lips on the white charger plate and a LARGE chocolate pair of lips. I will use the large lips as a prize. Closeup of the plate stack. On top is the red lips bowl. 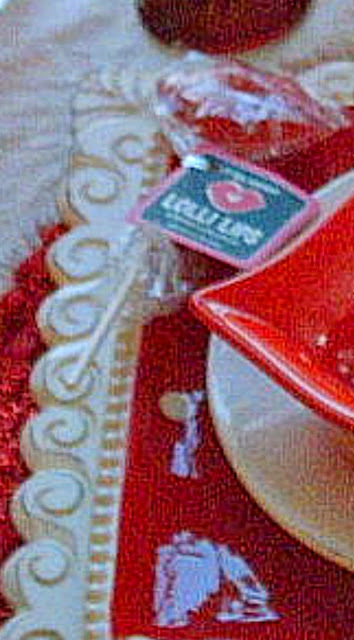 Underneath is an embossed with heart small plate. 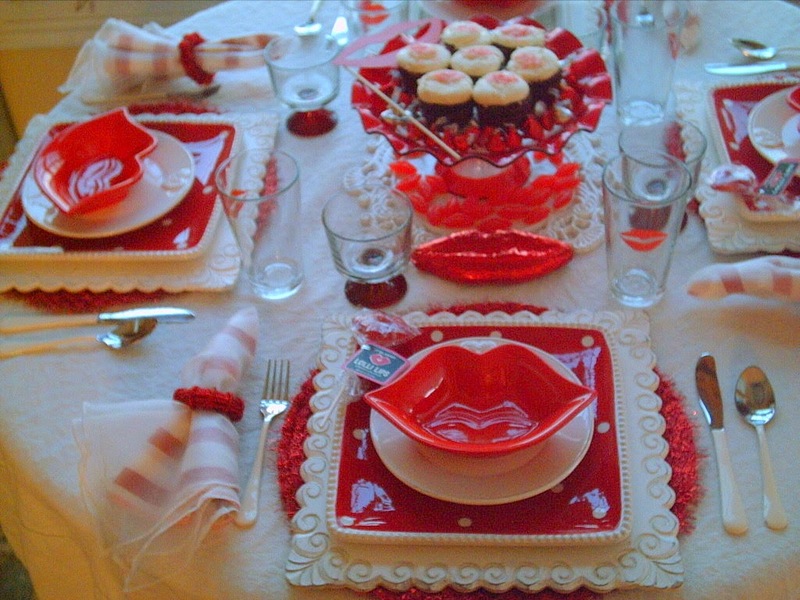 This tablescape for the most part does not have a heart theme. 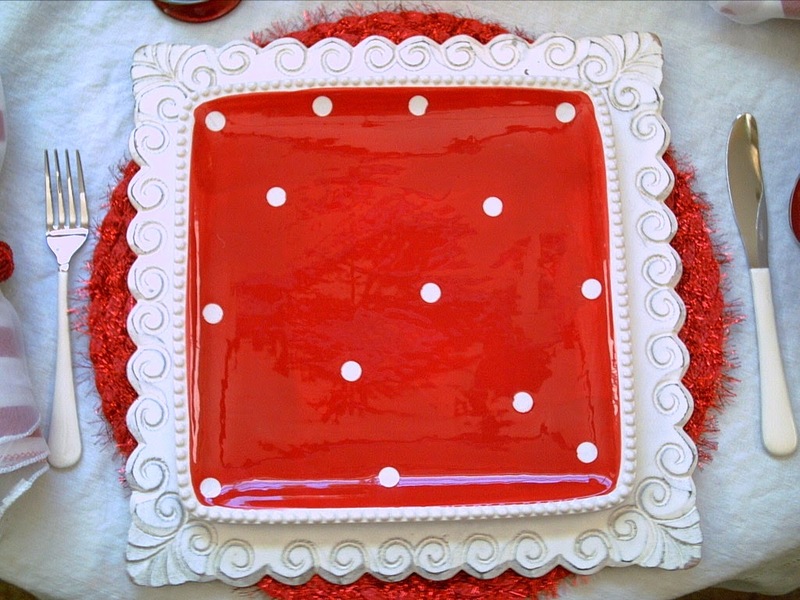 The dinner plate on bottom is the red with white polka dot plate with an adorable white rope border. White square charger and a red fuzzy placemat underneath all. I am using a white linen tablecloth. The napkin ring is woven red beads. 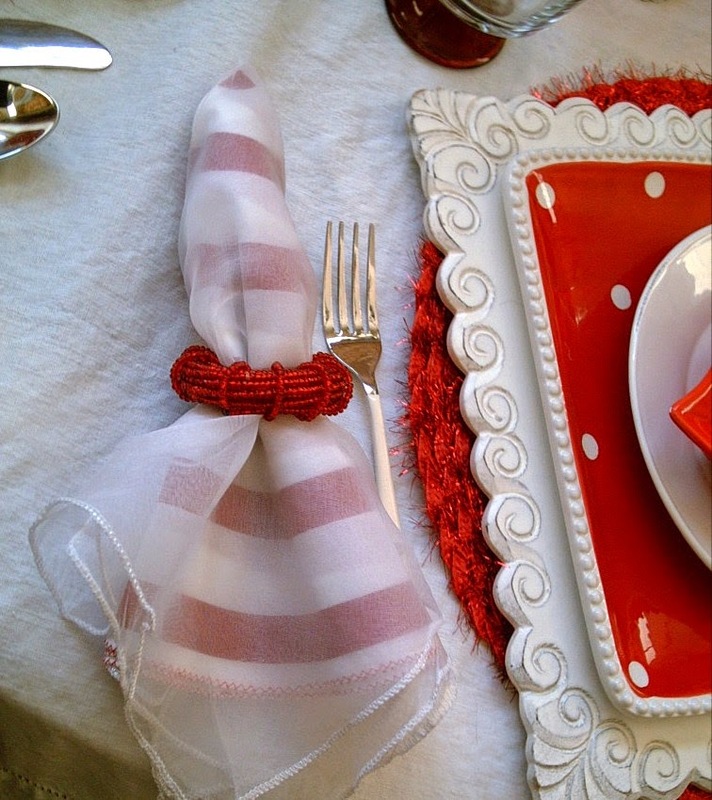 The napkins are doubled with a white sheer one on top and a red and white stripe inside. 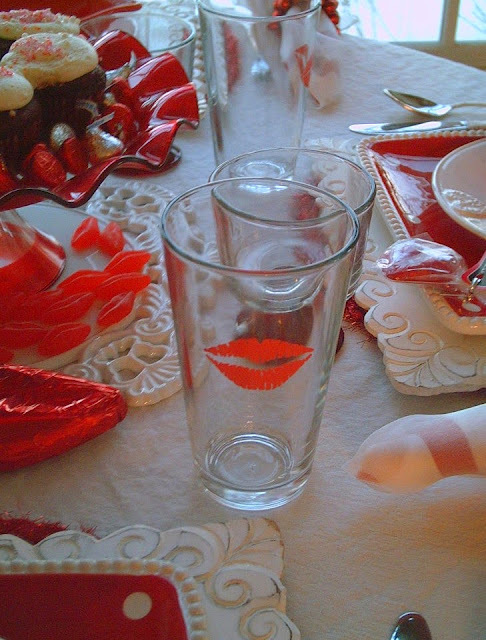 I purchased some very fun glasses from the dollar store that have an embossed pair of ruby red lips on them. How fun! 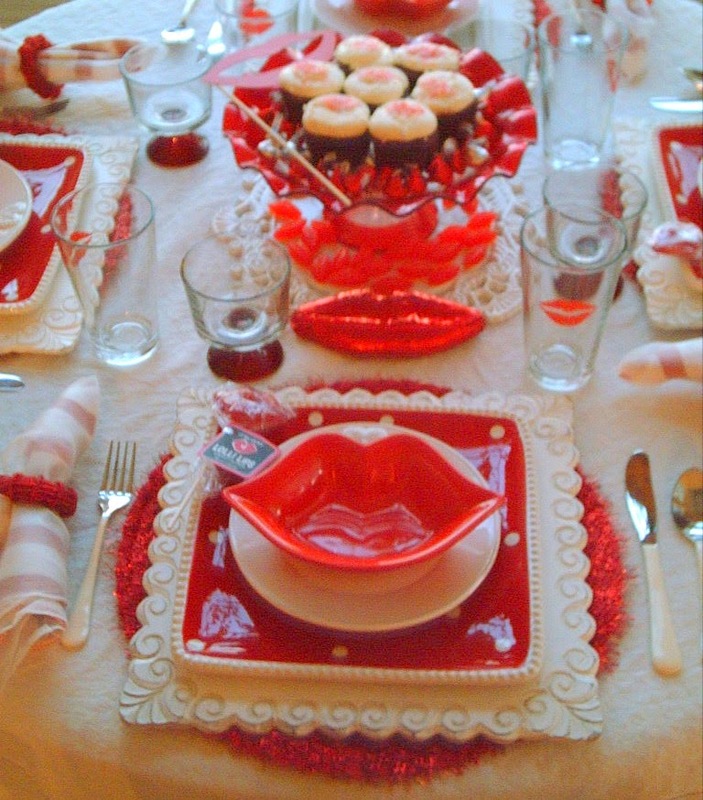 Each place setting has a party favor of a deep red edible glittered sucker. A fun take home. Have a wonderful Valentine's Day. Do something fun with someone or for someone, to make this day special. Placemat stripe napkin, and charger from Pier One. 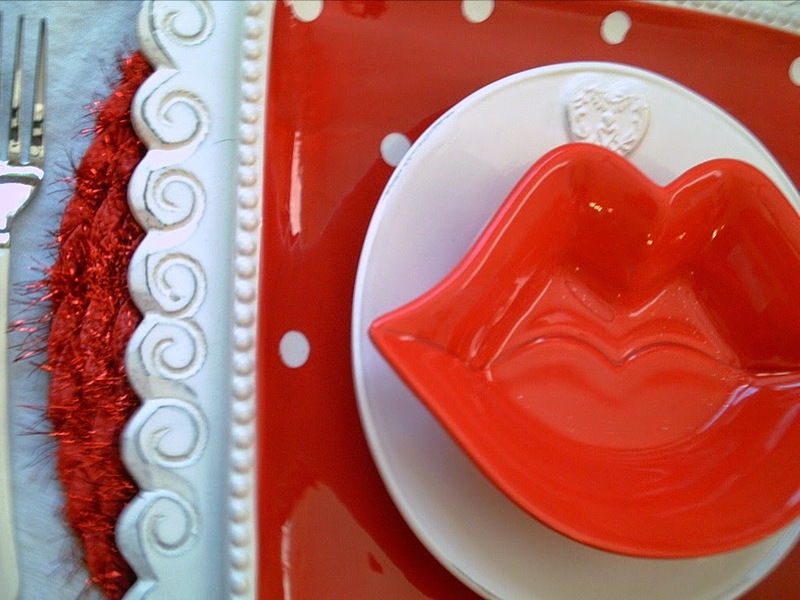 Red lips bowl and polka dot plate from Tai Pan Trading. 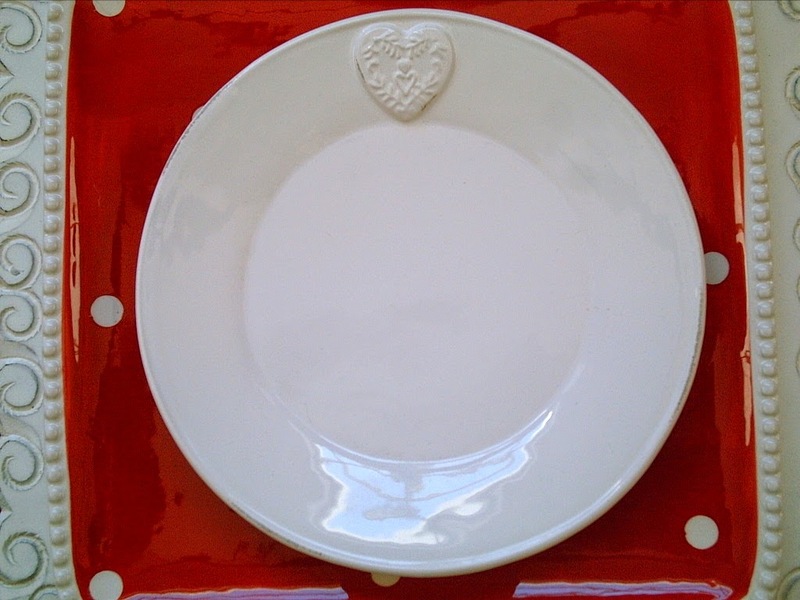 White small heart embossed plate and lip suckers from Thanksgiving Point Emporium. White napkin Z Gallerie. Sherbet dish Walmart (a long time ago) Lips glasses, Dollar Tree. White centerpiece charger plate from Village Whites (years ago). Cake stand, Home Goods. Large lips chocolate bar from Smith's Grocery (a Kroeger store)/ White handle flatware, World Market. 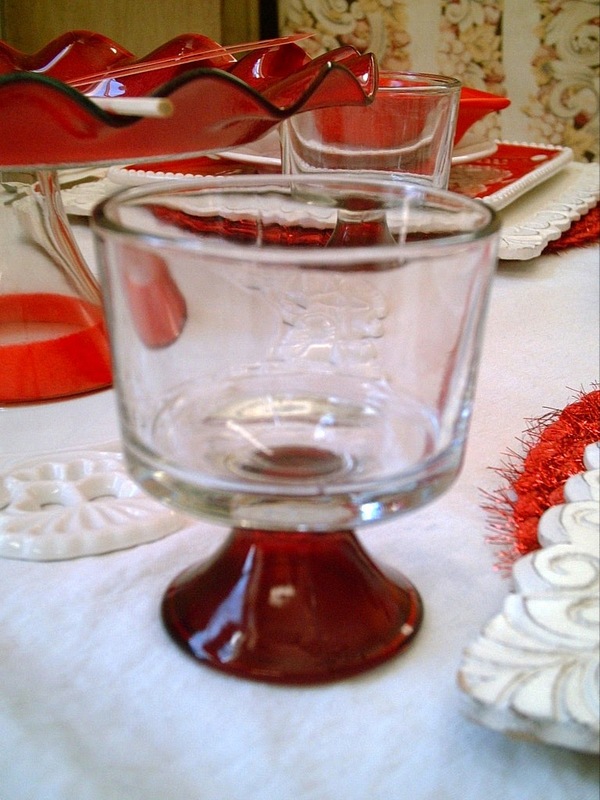 Red beaded napkin rings, Ebay. Side note. Tai Pan Trading is a fun store. Lots of dishes (tableware) and decor. They have 4 locations in Utah. One in Boise, Idaho. Two in California, Rancho Cucamonga and Costa Mesa. They plan on opening more stores in future. They have wonderful stylish items. Some of their tableware is seconds or discontinued items. Prices are usually quite low. What a cute table for Valentine's day! You found so many great pieces and pulled them together perfectly! The red lip print glasses - from Dollar Tree! Who would have thought? 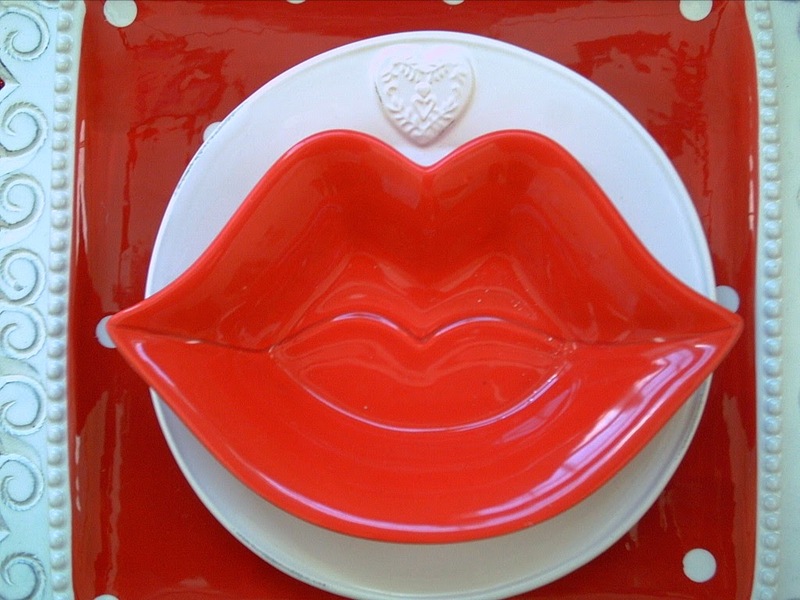 Wonderful table for Valentines! Those lip bowls are precious...everything looks great. This table is so much fun! 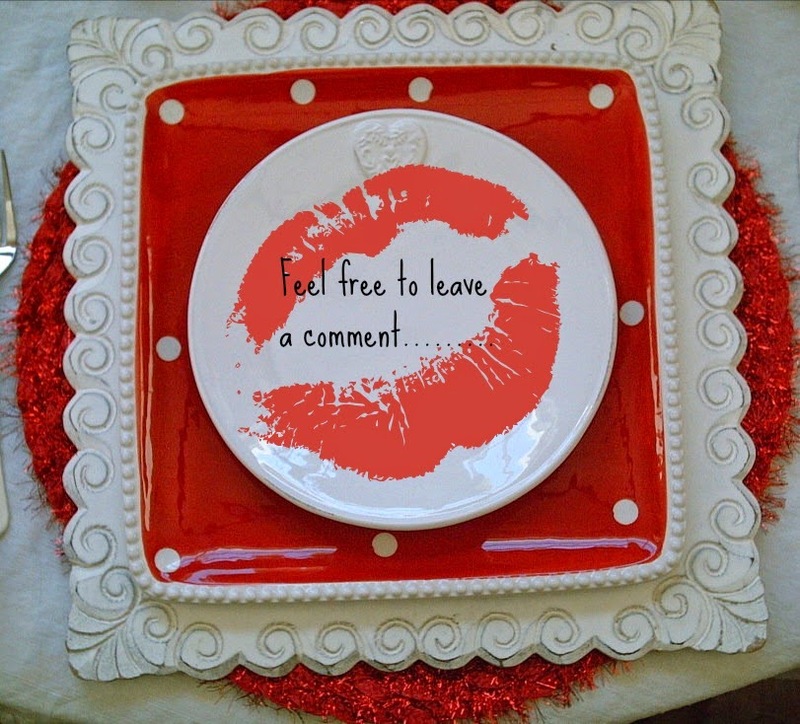 I love the red lips theme! The lip bowls pull everything together wonderfully. What a fun table! Love the lips. Clever take on Valentine's Day. And you even cupcakes to match the theme! Fun, fun. You carried out this unique theme beautifully! Your tables are so much fun and I am inspired to get out of my comfort zone when I see your tables. Thank you for sharing with us this week at Celebrate Your Story, have a great weekend.